Graphic designers rely on their imaginations to envision projects full of shape, dimension and color. But turning that creative vision into reality requires knowledge about the capabilities of a mix of media as well as fabrication techniques. So, when sales and marketing executives at the Uniwood®/Fome-Cor® Division of Nevamar Company wanted to remind graphic designers of what they can do with original Fome-Cor® graphic arts board, they turned to a symbol of artistic expression that could also showcase fabrication processes. The Fome-Cor Board Artist’s Palette lets designers “See What You Can Do®” with original Fome-Cor graphic arts board. This promotional giveaway, measuring approximately 10 inches by 7.5 inches, features bright gold foil mounted to both sides of white Fome-Cor board in the 3/16-inch thickness. 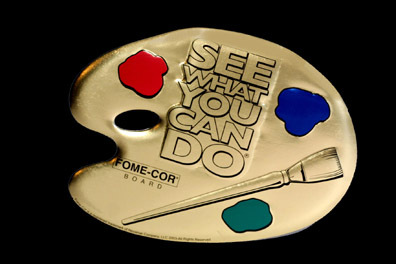 The artist’s palette image – screen-printed with four flat colors on one side of the acrylic-lacquered foil – is dynamically decorated with a paintbrush; paint dabs in hues of bright red, blue and green; a Fome-Cor board logo; and “See What You Can Do” marketing slogan. 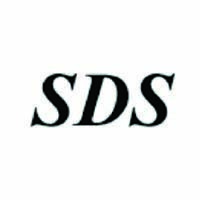 Steve Blives, owner of Blives Consulting LLC, a St. Louis-based graphic design firm, was asked to develop the design for the artist’s palette. “When we were first approached by Uniwood/Fome-Cor to create the artist’s palette, we talked about incorporating color with paint swatches,” says Blives. “But we wanted to do more to demonstrate how well Fome-Cor board embosses. So we added the paintbrush and ‘See What You Can Do’ lettering. The artist’s palette – printed nine-up on the foil – was mounted with water-based adhesive to 30-inch by 40-inch sheets of Fome-Cor board. Once mounted, the palettes were die-cut and embossed adding dimension to the paintbrush, color paint dabs and “See What You Can Do” slogan. The edges and oval thumbhole cutout were die-cut with closed edges to create an overall three-dimensional effect for the piece. When die-cut, Fome-Cor board’s edges compress completely and stay closed permanently. It also may be embossed or debossed. 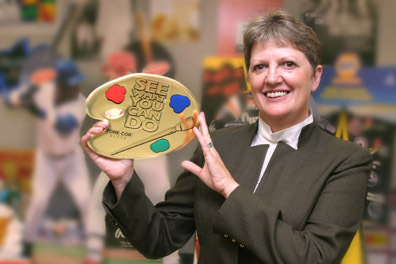 Valerie Struck, general manager of St. Louis-based Printers Finishing Services, Inc., a division of Loy-Lange Box Company, Inc., managed the fabrication of the palettes. From start to finish, fabrication of 5,000 artist’s palettes was completed in approximately three to four weeks. While she learned a few lessons from the process and may choose to mount the foil before screen-printing on additional orders, one media performed just as she knew it would. “I know what to expect from Fome-Cor board,” according to Struck, who says her point-of-purchase and point-of-sale customers often request original Fome-Cor board by name. “Fome-Cor board has very little warp,” says Struck. “A lot of customers ask for it for that reason. Corrugated cardboard and fiberboard substrates have a tendency to warp when exposed to moisture and humidity while Fome-Cor board does not. Fome-Cor board (introduced in 1959) was the first foam board on the market and is still the board that graphic artists’ ask for by name. It consists of extruded polystyrene foam bonded between various high-quality papers that feature a smooth surface for decorating. Fome-Cor board is lightweight, rigid, warp-resistant and easy to cut. Original Fome-Cor board in the 3/16-inch thickness is available with white liners/white foam in 10 standard sizes ranging from 20-inch by 30-inch to 60-inch by 96-inch sheets. Fome-Cor board in the 3/16-inch thickness also is available with black liners/black foam and one black liner/one white liner/white foam. Fome-Cor board products produced in both the 1/8-inch and 3/8-inch thickness also can be used in die-cutting and embossing projects. To request your free Fome-Cor Board Artist’s Palette, call (800) 438-1701.